FINN.no is Norway’s largest online marketplace. FINN.no is a story of disruption and innovation, and we have a goal of being one of the most innovative companies in the world. This story is about our people. The full story - people, processes and tools - can be read on the MIX-site by following this link. FINN.no is a story of disruption and innovation. In the late 1990’s Schibsted decided to start a new online-company, outside the established organization, to really take advantage of the new possibilities given by the Internet. The idea was to move the newspaper classified ads online, and by that enable new revenue streams and business models. FINN.no was founded in 2000 to be that spearhead, and was given the mandate to cannibalize the newspapers business model. Now, fourteen years later, online classifieds are a major part of Schibsted’s revenue and FINN.no is one of 20+ companies in Schibsted Classified Media. Today the marketplace consists of several different categories; cars, real estate, jobs, travel, general merchandise and services/craftsmen. FINN.no is Norway’s fourth largest website (measured in unique users) and market leader in almost all categories. Measured in page views, FINN.no is Norway’s largest website with over 800 million page views per month. FINN.no has also succeeded in establishing a revenue model based on people paying to advertise, whereas various competitors offer such listings for free. As a result FINN.no is very profitable with a profit margin above 48%. Innovation is a strong part of our company’s history since FINN.no itself is an innovation. 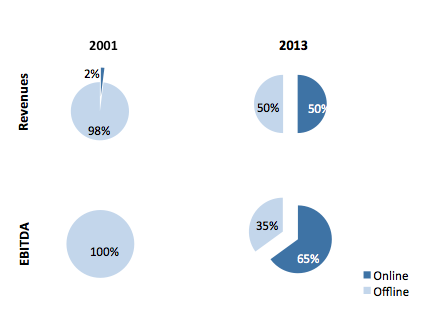 However, when we looked at our large market share in 2006, we saw a strong limitation for further growth. We have also seen stronger competition from global competitors like LinkedIn and Facebook. Because the Internet is such an effective distribution channel, the competition is global and highly dynamic. A startup can become a large competitor within a year, a huge contrast to the old industrial economy. Based on this analysis we decided to gear up our innovation efforts. Since we strongly believe that innovation is about people we measure and benchmark our efforts in building a culture where innovation can thrive. Twice a year every individual gets feedback based on how they have adhered to these values. Feedback is given by colleagues in the same team and the team manager, both in writing and orally. Oral feedback is given in group sessions facilitated by an external consultant. Every team member gets feedback from the rest of the team on what is good and what should be improved. The value “Tolerance” is used to create a good atmosphere for constructive feedback. Once a year we organize a party called FINN Awards where prizes are given to teams or individuals in different categories, one being “Innovation of the year”. The values are used as a part of the evaluation criteria in every category. To have an external benchmark on how we succeed in building a healthy corporate culture we have participated in Great Place to Work for the last eight years. GPTW measures elements like autonomy, freedom and influence, important building blocks for an innovative culture. We have succeeded in becoming the Greatest Place to Work twice (2011 and 2012) in Norway, and have been listed top 4 in 2006-2013. 95% of all employees say they are looking forward to go to work every day. This serves as a good benchmark, but also as a tool for strengthening employer branding. Feedback given in GPTW is actively used by the management group to adjust and prioritize actions. Autonomy must have direction, without direction individuals and teams will end up working on what they define as important not what is important for the company. We have defined a high-level process to visualize the connections between goals and where teams and individuals have different levels of autonomy. 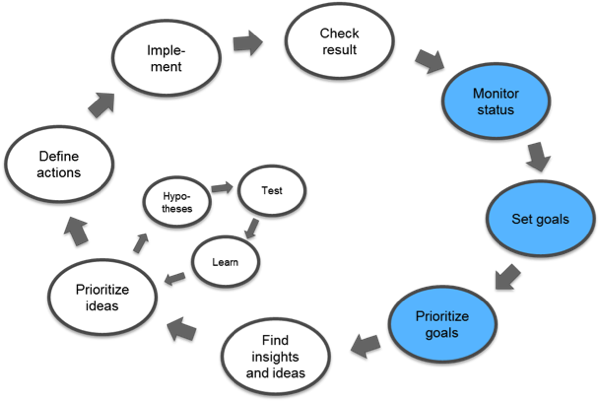 The blue circles are management tasks: monitor status and set goals. When goals are prioritized and understood, teams or individuals can go about finding insights, generate ideas and finding the right actions to implement. When actions are implemented, results can be checked to see if the goal is obtained. If not, a new round of insights, actions and implementation is carried out. By clarifying that management/leadership is about setting goals/directions and that teams and individuals should define and implement the right actions, you enhance autonomy on team and individual level but also ensure the whole organization works in the same direction. Each year we arrange the FINNovation-day, a 24-hour idea hackaton. FINNovation day is all about creativity and playfulness. All employees can attend, last year almost 20% attended. The output can be ideas and concepts that can be implemented, but the purpose of the day is mainly to offer a training ground for skills and behaviors. Either you are trying to “sell” an idea or help nurture and develop an idea. The day starts off with forming teams and elaborate ideas. The teams are free to explore almost everything, both ideas that can fit FINN’s current strategy or completely “wild” ideas. The hackaton ends with a presentation and poll in front of all employees, and prices are handed out. The ideas that fit FINN’s strategy are then evaluated by the management team. The most important aspect of the FINNovationday is the freedom to work on ideas that matter for the individual and the possibility to present it to all your colleagues and get an assessment by the management team. The FINNovation day bypass all formal “does and don’ts” and embrace engagement and autonomy. To strengthen the innovation culture and to foster an intrapreneurial skillset we have launched a concept called Sandbox. Sandbox is a concept that allows employees to develop their own products based on data from FINN.no. FINN.no, being an online marketplace, has lots of user data and Sandbox enables the use of some of these datasets. Employees sign a contract with FINN.no allowing them the use of data. When a product is launched, any revenue is split 70/30 (Employee/ FINN.no). Besides from the potential upside, a Sandbox-contract also gives access to a range of support: ads on FINN.no, help from the innovation team, access to server and development-tools and Schibsted’s payment platform. Sandbox may foster competitors to FINN.no, but we believe that the benefits of intrapreneurship overshadow the fear of competition. It is also a useful tool to support autonomy and involvement. If someone has a great idea, but it doesn’t fit our current strategy, they can be given the opportunity to launch it as a Sandbox initiative. As a “Sandbox’er” you are a true entrepreneur, and no strings are attached when it comes to processes and tools. 15 employees have signed a Sandbox-contract and last year the first solution was launched and is available in Apple App Store. To succeed in building an innovation culture, and to learn more about the unknown, experiments are one of the most important building blocks. We also use experiments to strengthen autonomy. If an experiment doesn’t require a lot of effort, or jeopardize the customer experience, it can be conducted without authorization. The beauty of an experimental culture is that you optimize learning and limit the fear and shame connected to failure. An experiment is built around a hypotheses, and hypotheses either stand or fall. In any case you have learned something, and this learning is valuable. If people are encouraged to conduct experiments, without formal authorization-processes, but with a requirement to share learning, you can enhance autonomy. We believe that many of the measures we have described are context-related and many of them are intertwined. Other companies will experience other effects and have other lessons to share if they implement the same measures.